Everytime when mention of Tiffany & Co. I will think of the story of the bride who receives the ugliest Tiffany & Co. box. Do you want to hear the story? If you don't, you can skip to the tutorial part. You can use any white nail polish. I suggest you go got OPI Alpine Snow or any other white nail polish that is single coat. I had to paint the Elianto White Nail Polish two layer to get full opacity, it became really messy with so many layers on. As you might know (or might not know), China Glaze's For Audrey is the closest color to Tiffany & Co teal green (or blue). Technically there is no dupe color for Tiffany teal because the color has already been trademarked by T&Co. You can use any teal color if you don't have For Audrey. The process is really simple and it takes no practice to perfect it. However, remember to leave each layer completely dry before moving on to the next one. Step 1: Paint your nails with a white nail polish as a base. Make sure it is opaque. Step 2: Stick the manicure tape across your nails. And for the middle finger, make a cross with the vertical line closer to one side. If you're not sure what I'm talking about, get a Tiffany box as reference. Step 3: Paint the teal green on top of your nails, make sure not to reveal any of the white base you painted earlier. Step 4: Leave it to dry about 70% and then pull off the manicure tape slowly. If you make a mess, leave it and fix it later. 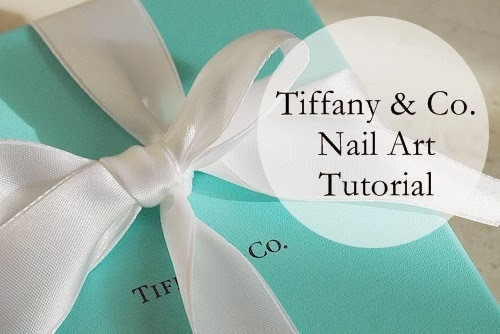 Use a small brush to perfect the line with either white or teal nail polish. Step 5: Use a dotting tool and make two big dots at the cross interception. Then draw a small line outward from the intercept to make it look like a ribbon bow. Step 6: Use the dotting tool and dot the teal color in the middle of the white dot you created earlier to give a hollow to the ribbon bow. And you're done!!! Secure it with a top coat. If you don't have a manicure tape, you can always use a small brush to create the white lines. If you're using the brush method, paint the teal color as base first. Then create the stripe with white nail polish. If you have a steady hand, the brush method will be less messy than the tape method. If you're trying this out, don't forget to share it on Instagram and tag me (@QueenJerine). I would love to see it! i love the china glaze audrey color! nice! and good tips. but i think it's still quite hard to make a clean line with this method eh?